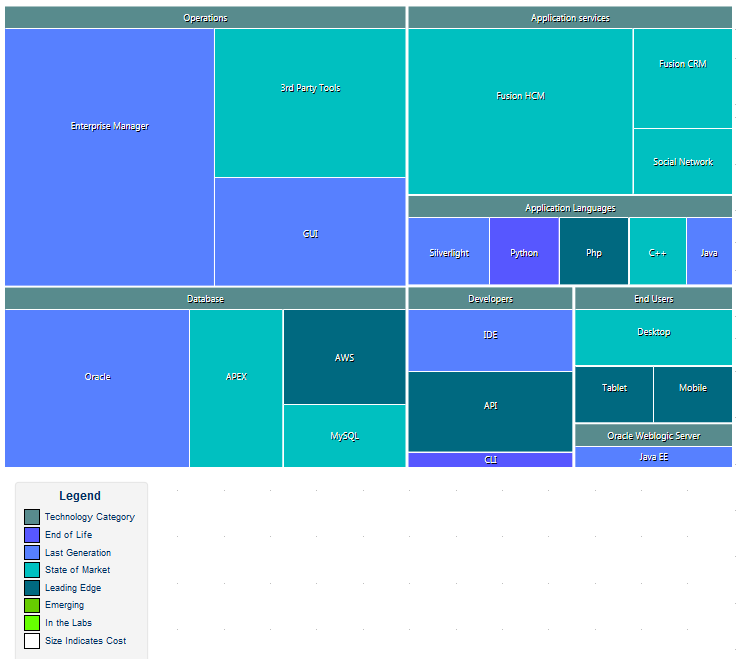 In addition to the more familiar Bar charts, Column charts and Pie charts, Enterprise Architect supports a grid-based layout called a Heat Map, which uses the color, size and grouping of cells to represent specific aspects of a data set. Heat Maps are typically used to illustrate co-dependant properties that could influence strategic or project level decisions. For example, a Heat Map might group Requirements by Requirement Type into a matrix of categories, then further divide each category by Requirement Status, using the number of requirements of each status as the determinant of cell size. As an additional visual clue, the color for each cell can use yet another variable from the data set; for example, a cost number based on the sum of expected costs associated with each Requirement. In common with other types of chart, you can construct the data set using either the dialog fields or custom SQL that you have created or copied. This example of a Heat Map indicates the relative costs of various elements of a software platform, at the same time showing (by cell color) what stage in a product lifecycle each component has reached. The use of Heat Maps depends to some extent on having good data that can be used to visually cue different aspects of the current model. For example, if you decide to use a cost analysis as part of a Heat Map, it is necessary to represent the cost using a field or Tagged Value. This should form part of the background modeling work that will feed the data sets driving well formed and useful Heat Maps. Select a Chart element on a diagram or in the Project Browser, then use any of the methods outlined here to open the chart element's 'Properties' dialog. On the chart element's 'Properties' dialog, display the 'Source' tab, then the 'Package' child tab. Having accessed the 'Properties' dialog pages for your Chart, you can start to configure your Heat Map. Click on the drop-down arrow and select 'Heat Map' as the chart type. Click on the button and select the object type and property that the Heat Map cells will represent. A cell is created for each unique combination of object type and property, and the size of the cell indicates the number of times that combination occurs. For example, if you select Element.Author each cell will represent an Author name, and the cell size indicates the number of elements in the data set with that author name. (Optional) Click on the button and select the object type and property that the grouping of the Heat Map cells will represent. For example, if you size by Defect.Status and group by Element.Author, each group will represent an Element Author and each cell within the group will represent the number of elements with that Author name having each of the defect statuses. (Optional) Click on the button and select the object type and property that the color of each cell will represent. If you want to color by the same object type/property combination as you used to size the cells, then leave this field blank. The color is retrieved by matching this combination with a color defined in the selected Color Set on the 'Appearance' page of the Heat Map 'Properties' dialog. Define which model and, if appropriate, which Package(s) to search for the data to represent in this Heat Map, as explained in the Source Package topic. As an alternative to specifying the parameters of the Heat Map in the fields on the 'Package' tab, you can select the 'Custom SQL' tab and create a customized Heat Map using SQL. You still specify the chart type in the 'Type' field, but the other dialog fields are grayed out. In this query, each cell will represent an Author and will be sized relative to the number of Component elements the Author has created. In this query, each cell and its relative size will represent a Defect status. Each cell will be grouped by author and colored on priority type. This query would be accompanied by a Color Set definition of Value Type 'String' with the values 'High', 'Medium' and 'Low' and their respective colors.